“Jumia was incorporated in Germany, its legal Headquarters is in Berlin, Germany, while its administrative Headquarters is in Dubai, UAE. Its global Technology centre is in Porto, Portugal. Its Top Executives aren’t African. The largest shareholder is MTN”, writes AfricaFactZone . 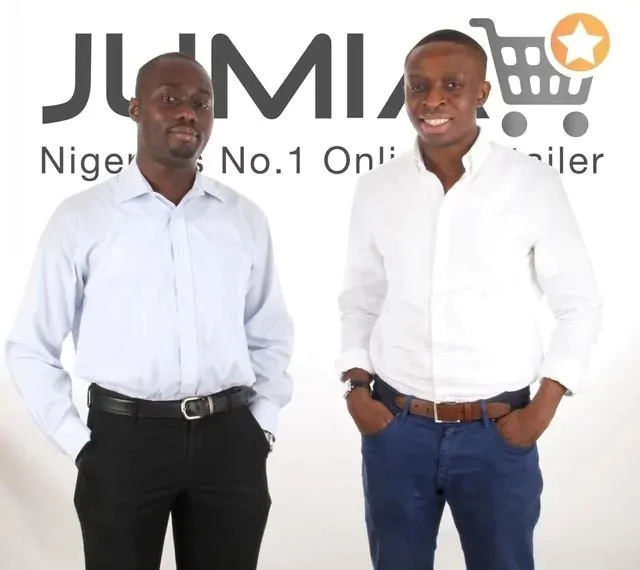 Yet, Jumia Nigeria was co-started with these two West Africans. People need to see their faces to understand that without Jumia Nigeria, the mission of Jumia cannot thrive. 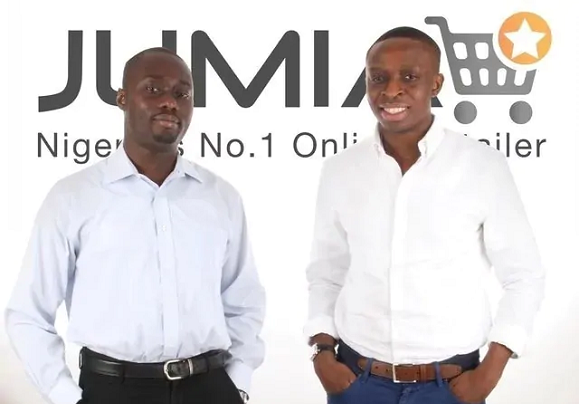 Raphael Afaedor and Tunde Kehinde are key reasons why Jumia trades in NYSE today. They must inspire a new generation of Nigerian entrepreneurs! Sure, the West Africans left in surprising ways, and today Sacha Poignonnec and the co-CEO run the show. Yet, Tunde and Raphael seeded, strategically, this company called Jumia. The money men have since changed the company. I just hope they will get something out of this major party in New York City with valuation hitting $3.9 billion. .
Well said Prof. these two bosses had that foresight in bringing the business to limelight after their Harvard studies. I was opportuned to be part of the team not up to 50 staff who toil day and night to see the dream come true. They were true leaders with high energy and drive for success. They sit on the same table deliberating and calculating the way forward when average daily order rate was at 30. The impossible was made so easy with their strategic and continuous improvement process. I celebrate them. As they say, great things start small. 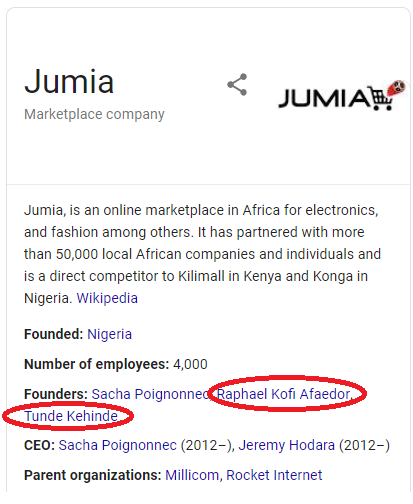 I remember seeing Raphaels name on some sensitive data point when i recently joined the group, and I had always longed to speak with him and know what they were thinking when JUMIA all started seeing what it has become today……. Fastforward today I think lessons has been learnt, younger entrepreneurs would learn how to forecast properly, know when to sell off, or when to remain, how to sell off and what clauses to have. I also remembered a tech start up that was sold for over 1million USD and 2 years down the line, they are no where to be found. Good decision to sell off on the part of the co-founders! Good value for them at the end. Hi Ndubuisi, yes these guys are cited as the Jumia Group cofounders but I think that we need to insist on the lesson to learn at this stage: Building champion companies takes time and commitment. While I hope these guys will get part of the financial return they deserve (provided they still have shares in the company), I also think that we, African entrepreneurs, should start thinking long-term and Shen starting companies, make sure that we’re there to stay, no matter what. And that’s where enabling environments could come in, in order to make sure that basic needs are covered in the early years, backed by a vision to champion industries. Recall the Steve Wozniak case with Apple and late Steve Jobs! As an entrepreneur, you should be in it for the long time. There will always be challenges along the way. You also need to be ready to get other people involved in the business. If the other parties have not invested in the business. Jumia could have been dead today. We have seen how greed and wanting to own it alone have killed good business that could grown in Nigeria. Congrats to them for let other people to be a part pf their business. Thank you for bringing this to the fore, the names of the guys were / ‘re now missing in Jumia’s recent success stories.